Colorectal cancer cell lines are extensively utilized preclinical model systems, including the DLD-1 cell line established from the tumorigenic epithelial tissue obtained from a 45-year-old adult male patient with colorectal adenocarcinoma by D.L. Dexter in 1979. In addition to being negative for ros, abl, and src oncogenes, the DLD-1 cell line is positive for myc, myb, ras, fos, sis, and p53 oncogenes. Also, DLD-1 cells express carcinoembryonic antigen (CEA) and colon antigen 3. The DLD-1 human colorectal cell line displays epithelial properties, including a cobblestone cell shape. Besides, DLD-1 expresses a truncated adenomatous polyposis coli (APC) protein, a tumor suppressor gene that plays a critical role in cell growth, as indicated in a 2016 article published in Biochemistry and Biophysics Reports. As one of the most commonly employed colon cancer cell lines, the DLD-1 cell line is involved in many medical and biomedical research applications related to colon cancer. One example is the 2015 study (Chen et al.) 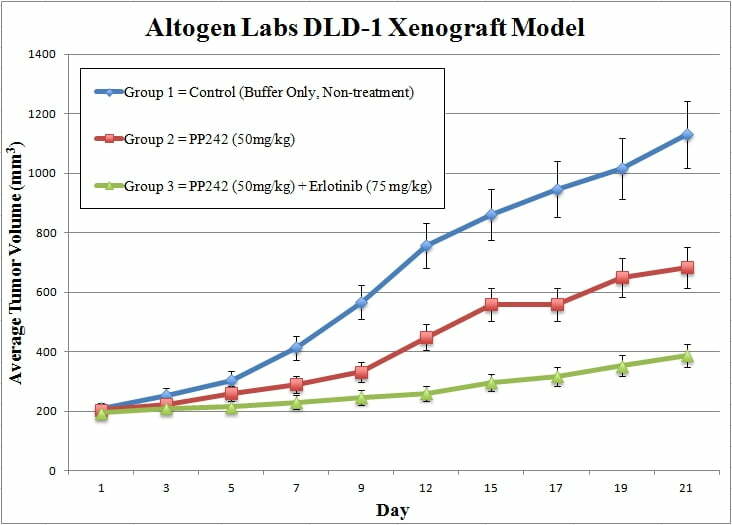 who used the DLD-1 xenograft model to study the oncogenic receptor tyrosine kinase (RTK) KIT in colorectal cancer (CRC); results indicated that KIT has a role in tumor growth promotion via autocrine or paracrine signaling. This provides a target for patients with KIT-expressing CRC. A 2008 study (Rhee et al.) used the DLD-1 xenograft model to study the role of toll-like receptor (TLR) signaling pathways, potential immunotherapy targets, in CRC. Results indicated that innate immunity is mediated by flagellin via TLR5 signaling which could be clinically relevant as a specific immunotherapy target. The last example for DLD-1 model usage in research is the 2012 study (Caysa et al.) which reported the development of a non-invasive method for imaging in vivo xenograft tumor growth and subsequent response to chemotherapy via multispectral fluorescence. DLD-1 cells are used to create the CDX (Cell Line Derived Xenograft) DLD-1 xenograft mouse model that enables studies on anti-EGFR therapeutics, such as IMC-C225, in combination with other conventional chemotherapies. 1. Until collection cells are maintained under exponential growth. 2. DLD-1 cells are prepared for injection via trypsinization. Viability of cells is determined using a trypan blue exclusion test (required 98% viability). The cell suspension is then adjusted to the appropriate density. 3. All mice (athymic BALB/C or NOD/SCID, 10-12 weeks old) receive a single subcutaneous injection into the hind leg, containing one million cells (100 µL of Matrigel/DLD-1 cell suspension). 4. All injection sites are palpated up to three times weekly until tumors are established. Tumors are then measured utilizing digital calipers; average size of 50-150 mm3. 5. Animals are randomized into treatment cohorts; administration of the compound of interest is performed following the treatment schedule. 7. Animals are euthanized as tumor size reaches 2,000 sq millimeters (or at the predetermined size limit for the study per IACUC protocol). 8. Final necropsy and tissue collection are performed as agreed upon for termination of experiment. 9. Tumors are removed and weighed; tumors are documented by digital imaging. 10. Gross necropsies are performed; tissues are collected for downstream analysis. 11. Tumors and tissues are prepared for histology, snap frozen in LN2 or stabilized for gene expression analysis.